The Argentine army’s “Dirty War” disappeared 30,000 people, and the last thing Pepe Carvalho wants is to investigate one of the vanished, even if that missing person is his cousin. But blood proves thicker than a fine Mendoza Cabernet Sauvignon, even for a jaded gourmand like Pepe, and so at his family’s request he leaves Barcelona for Buenos Aires. What follows is perhaps Manuel Vázquez Montalbán’s masterpiece: a combination white-knuckle investigation and moving psychological travelogue. 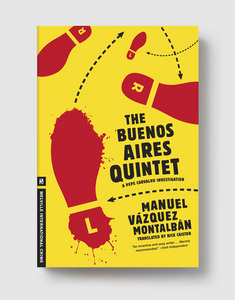 Pepe quickly learns that “Buenos Aires is a beautiful city hell-bent on self-destruction,” and finds himself on a trail involving boxers and scholars, military torturers and seductive semioticians, Borges fans and cold-blooded murderers. And despite the wonders of the Tango and the country’s divine cuisine, he also knows one thing: He’ll have to confront the traumas of Argentina’s past head on if he wants not only to find his cousin, but simply stay alive. Born in Barcelona in 1939, MANUEL VÁZQUEZ MONTALBÁN (1939–2003) was a member of Partit Socialista Unificat de Catalunya (PSUC), and was jailed by the Franco government for four years for supporting a miners’ strike. A columnist for Madrid’s El País, as well as a prolific poet, playwright, and essayist, Vázquez Montalbán was also a well-known gourmand who wrote often about food. The nineteen novels in his Pepe Carvalho series have won international acclaim, including the Planeta prize (1979) and the International Grand Prix de Littérature Policière (1981), both for Southern Seas. He died in 2003 in Thailand, on his way home to Barcelona. NICK CAISTOR’S translations from the Spanish and the Portuguese include works by José Saramago and Paulo Coelho, and he is the author of Che Guevara: A Life.